The platform forms part of the turnaround loop that is still used by the 6 train today. 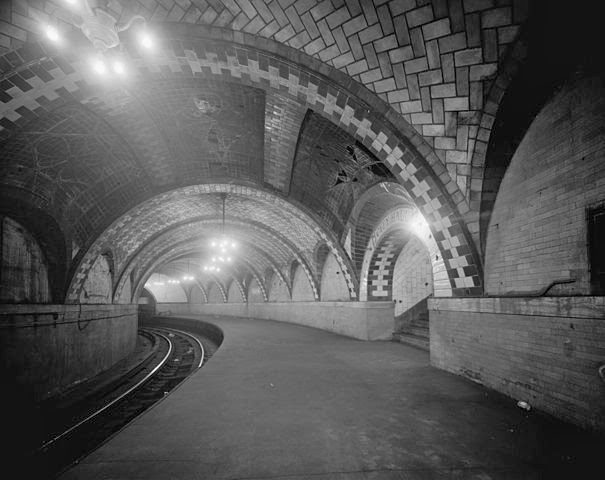 Located beneath City Hall Park, the original City Hall subway station was the southern terminus of New York's first subway and was inaugurated October 27, 1904. (New York had consolidated as as the five-borough city we know in 1898, drawing vastly more land under a single government; subways were seen as instrumental for ensuring the city's place among the world's great metropolises.) The original subway route took passengers through Midtown, Times Square, and up to the mid-140s past the Upper West Side. You can read more about the stunning station here or here. I've superimposed the above schematic onto a Google Maps map below. The Brooklyn Bridge extends from the lower-right corner of the map. There is no trace of the old post office footprint in what is now an open grass area today. 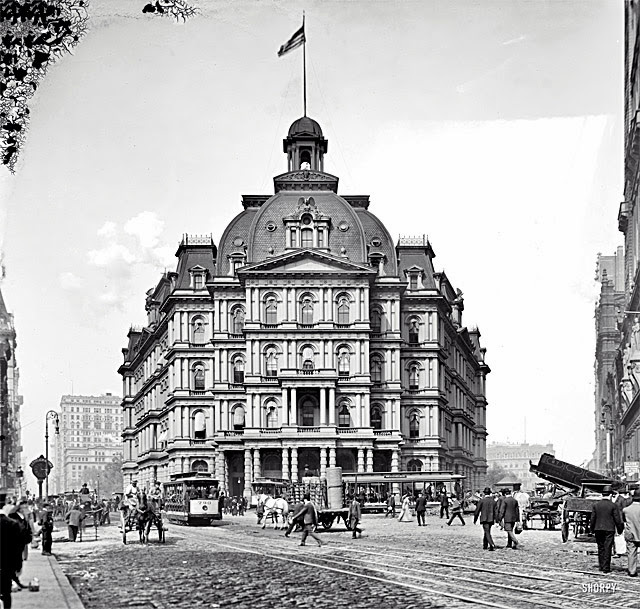 The post office building in question, sometimes referred to during its existence as "Mullett's Monstrosity" after the architect who designed it, was constructed over the course of a decade (1869 to 1880). Designed to enable the processing of more than 100 tons of mail per day, the five-story building also housed federal courts. The building was constructed at what was then $8.5 million. It was the predecessor to the world-famous James A. Farley Post Office Building, which became (and continues to serve as) the main post office for New York. The "Monstrosity," for its part, was completed not a moment too soon; from 1844 to 1875 New York's post office had been housed in a church building constructed in 1731(!). The building extended underground, with a "basement for sorting mail and a sub-basement for machinery" (Wikipedia). 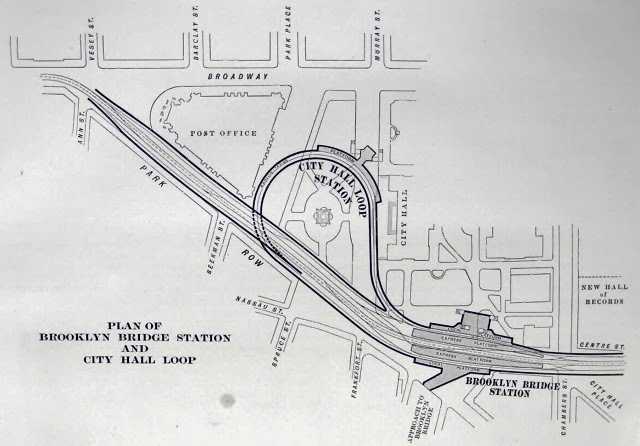 And thus it came to pass that the needs of the city's new subway would defer to footprint of the massive federal post office. Daytonian in Manhattan has a fantastic write-up of the now-demolished federal building, featuring many images of the structure.